Your baby might not be called Ella, but we’re quite sure that they (and you) are going to love All4Ella baby products, regardless! After all, they’re cute, practical, and are out to save you time and effort…as any good accessory for a little one should. All4Ella is also a wholly Australian-owned company out of Melbourne looking to bring bright and cheerful design to mums, dads and their bubs all over the country. All4Ella have some pretty exciting ideas in their noggins’…they’ve even come up with a delightful way to attach muslins to your little one’s pram. Made from durable plastic, these Pegs will hold your muslins in place to protect your baby from the sun while you’re out and about, so that you can both continue your day with a smile. These big, chunky Pegs are available in a number of sunny colours, and easily clip on to most pram models with their wide-opening, hinged mouths. Allow you to easily attach muslins to your baby's pram, protecting them from sun and wind when you're out and about. 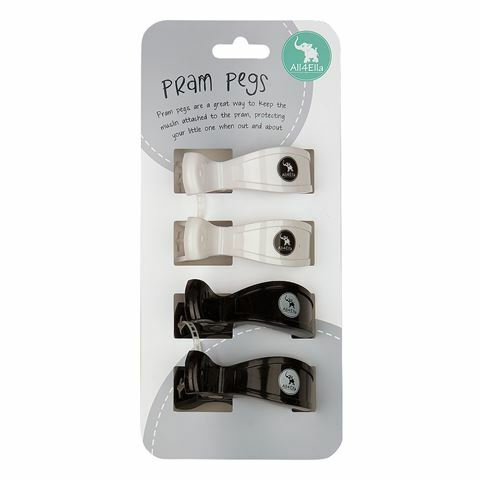 Pegs will fit most prams. Dimensions: 5cm (w) x 8cm (l).